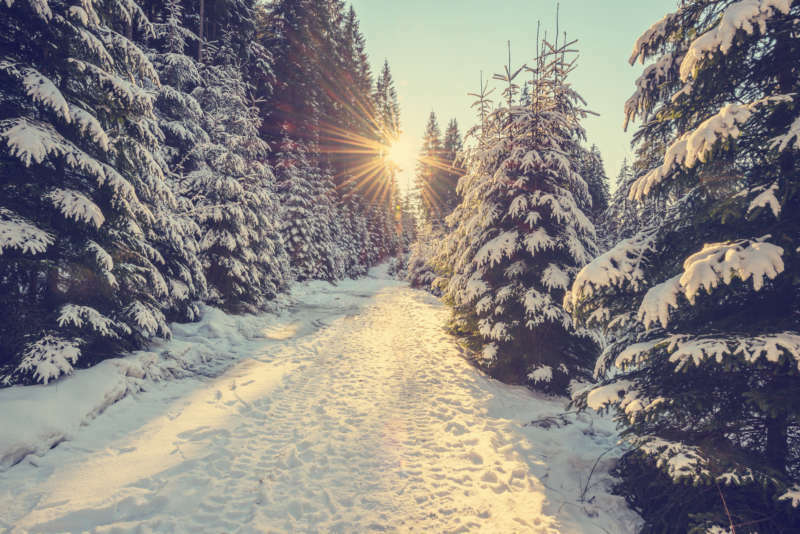 The colder months of the year bring a lot of exciting things: beautiful weather, an escape from the heat, fall sports, snow, holidays and more. However, they can also mean pain for people who struggle with consistent inflammation or spinal problems. If you've spent time outdoors when temperatures are low, you may have felt that old, familiar twinge in your back start to flare up. Many people believe that cold weather can cause or exasperate back pain and in this blog post, we’ll discuss whether or not that idea has any scientific merit and how you can keep your back from hurting during the fall and winter. In short, cold weather can cause back pain because it causes the muscles, tendons and ligaments that support the spine to tighten. This can put strain on your spine and pull on the sensitive nerve roots exiting the spine, causing pain. Additionally, if joints are already inflamed, a drop in barometric pressure or temperature can cause swelling and pain. So there’s the short answer, but what does the science say? 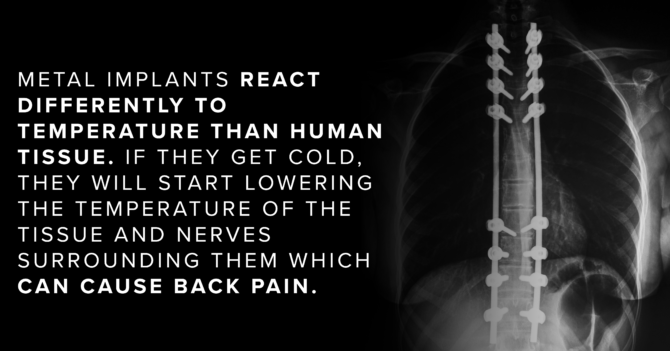 While there has been some debate in the scientific community as to why cold weather causes back pain, there's really no debate around the fact that it occurs. Several major studies have proven that there is a real correlation between low temperatures and reports of pain. For example, in 2012 a large study was conducted in Sweden on nearly 135,000 construction workers who spent several hours a day working in the cold (1). Researchers found that, when compared to people who spent most of their days working inside, the men who worked in colder temperatures had more reported instances of back and neck pain. A second study in Finland had very similar results as well (2). Have you ever stepped outside on a chilly morning and felt your body stiffen? This is a completely natural response to chilly weather and one of the main reasons why your back can hurt on a cold day. When faced with low temperatures, a process called vasoconstriction occurs within the body which, essentially, is the process of narrowing the blood vessels in your extremities and diverting that extra blood to vital areas like the brain, heart, lungs and bowels to keep them warm. When muscles, tendons and ligaments have less blood, they grow stiff. You've likely experienced this if you've ever tried to text or type on a keyboard after your fingers were cold and found that you moved extraordinarily slow. It’s the same with the structures supporting your spine. 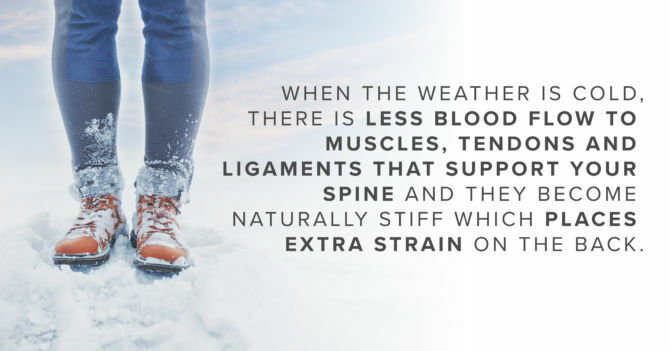 When the weather is cold, there is less blood flow to the structures supporting your spine and they become naturally stiff which, in turn, places extra strain on the back. It’s important to note that the majority of spine pain is caused, not by a problem with the spine itself, but by strain or injury to the muscles, tendons and ligaments that give it support. If these tissues are stiff and pull on the sensitive nerve endings in the spine—which is common—it can feel like your back is hurting despite the fact that the source of the pain is not the spinal structure. Additionally, shivering is another typical response to a decrease in temperature. Shivering, through quick muscular contractions, helps naturally produce heat for the body. However, it can also leave muscles feeling stiff, cramped or tight—even if it is subtle or undetected. This means that you’re more prone to back pain in colder weather simply because of your body’s natural response to it. The link between barometric pressure and back pain has been hotly contested over the years. The truth of the matter is that, to date, there have been no scientific studies to definitively prove that a drop in pressure can lead to back pain. However, people for thousands of years, even dating back to Hippocampus in 400 B.C., have been able to “feel” when a storm is coming simply by the pain they experience within their joints. While there may be no cut-and-dry scientific link to barometric pressure and back pain, the sample size is simply too large to ignore. 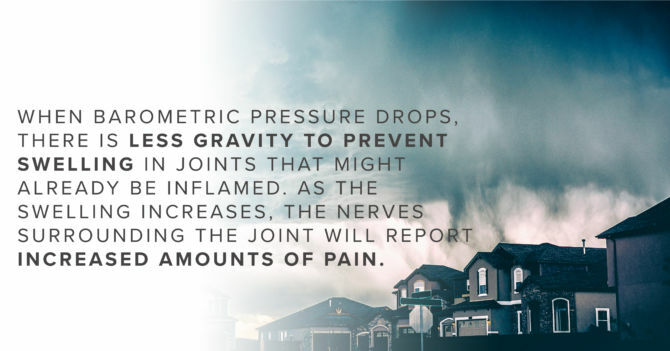 The most popular hypothesis suggests that when the barometric pressure drops before a storm or the temperature changes drastically, there is less gravity to prevent additional swelling in joints that might already be inflamed from a previous surgery, injury or condition. As the swelling increases, the nerves surrounding the joint will register this change and report increased amounts of pain. Research has shown that cold weather and dark days can contribute to what is known as seasonal depression which can cause or aggravate back pain. Seasonal affective disorder, also known as SAD, is a type of depression that typically occurs yearly, starting in the fall and lasting through the winter months. There are a number of factors that can cause seasonal depression including the decreased amount of sunshine throwing off your body’s circadian rhythm, a drop in serotonin levels due to decreased amounts of sunshine or a drop in serotonin levels (4). Whatever the cause, back pain is a somewhat common occurrence in people who experience seasonal affective disorder. Some studies have suggested that depression can cause increased levels of inflammation through proteins known as cytokines. Cytokines serve as cell-signaling molecules and stimulate the movement of healing cells toward sites of infection and inflammation. However, excessive amounts of inflammatory cytokines can lead to inflammatory diseases, which is one of the most common causes of back pain, and depression. Seasonal depression can also cause fatigue, increased perception of pain and decreased interest levels in daily activities which can prevent people from exercising and strengthening the muscles that support the spine, which can cause back pain. Daily, low-impact exercises like walking, swimming or biking are some of the best ways to ward off back pain. However, in the cold fall and winter months, it can be too cold, or too dangerous to venture out on a walk or bike ride on a consistent basis. This being the case, many people simply take a hiatus from exercise until the weather starts warming up again. This is one of the worst things you can do if you struggle with back pain. Below is a graph from a study by Gallop that demonstrates just how sharply exercise declines from September to December every year (5). Muscles need continued exercise in order to remain strong and if you are neglecting to work out when it's chilly, you are opening yourself up to injury further down the line. The fall and winter months are chock-full of back-intensive activities including raking leaves, shoveling snow, skiing, chopping wood and much more. If your back isn’t strong enough to handle these activities, it’s likely that you’re going to experience back pain. DO METAL IMPLANTS CAUSE SPINE PAIN IN COLD WEATHER? People who have undergone a spinal fusion or had metal implants placed in their spine commonly complain of pain during the colder months of the year. This occurs because metal loses heat more quickly than natural tissue and, if it does, the nerves surrounding the device can get cold as a result and cause pain. While most interbody devices are not supposed to conduct heat or get cold, the simple fact of the matter is that these items are not made of living tissue and therefore react differently to changing temperatures. These implants have no method of regulating their temperature, like most of the natural structures in our body, and are dependent solely on outside forces. For example, have you ever touched a metal pole during the winter time? Have you noticed how much colder it is than your body? Now what would happen if you wrapped your hand around that pole and left it there for a really long time? The pole might warm up a little bit, but it’s more likely the temperature in your hand would drop first because the metal is taking your heat so quickly. The same concept applies to implants. If you allow the metal to get cold, it can be difficult to warm it back up again and it will likely start lowering the temperature of the tissue and nerves surrounding it which can cause anything from mild to severe back pain. It’s important to note that the location of the metal interbody device certainly plays a role in whether or not you feel it significantly during the colder months of the year. People whose device is simply covered by skin or a thin layer of soft tissue are much more likely to experience aching and pain when they allow it to get cold. Nevertheless, anyone with a metal interbody devices should take extra steps during the fall and winter to make sure they keep the location of the implants warm. The best thing you can do to avoid back pain when it’s cold is to make every effort to keep yourself warm at all times, but especially when you’re outdoors. Wear extra layers and be sure to keep your back and neck covered by tucking in your shirt and/or wearing a scarf. In your home, keep the heat turned up and consider using an electric blanket to keep your muscles from tightening during the cooler night hours. Additionally, consider purchasing a pair of winter boots that have good traction. Traumatic falls are one of the easiest ways to usher in a serious, painful spinal condition like a herniated disc or fractured vertebrae. A good pair of boots will help prevent you from falling on icy or wet surfaces while you’re out and about during the colder months of the year. If you struggle with seasonal depression or simply want to ward off back pain when the temperature drops, you need to be working out your body consistently (6). While it may be difficult to continue doing the activities you once enjoyed during the summer months, you can still enjoy the benefits of low-impact, inflammation-fighting exercise while not exposing yourself to the bitter elements. Swimming remains one of the best forms of low-impact exercises for your back. Water provides buoyancy, which helps support your spine and take stress off your joints while providing a weight-free environment to strengthen many of the back muscles that support the spine. While you can’t just jump into your local pool like you could during the summer, there are likely some indoor, heated options around you. You may have to buy a membership to a local recreation center or gym that has a pool, but if you’re using it consistently, the membership fee will pay for itself in the benefits it provides you. The great thing about walking is that it can be done virtually any time of the year. Walking helps strengthen the muscles in the legs, feet and back that are responsible for supporting the spine, plus it helps drive blood flow to the areas of your back that might be prone to inflammation. However, if you decide to walk consistently throughout the fall and winter months, make sure that you bundle up on the cold days. Indoor aerobic exercises like yoga can be great for your spinal health. However, these exercises can also aggravate your spinal symptoms depending on your condition, so speak to your spinal specialist before enrolling in a class. In the end, the best way for you stay happy and pain-free during the cold months of the year is to make sure that you bundle up, avoid unnecessary strain on your spine and finding new ways to continue exercising. It’s also important to mention that daily back or neck pain is not normal. If this is something you’re experiencing, get in touch with our neurosurgeons and see how you can start to address it.